Forecast: a week of 100-degree temperatures. Back when I lived in Texas, I would’ve though nothing of it. But now I am acclimated to the mild temperatures, endless drizzle, and pale skin of the Pacific Northwest. So this kind of forecast puts the fear in me. If anyone’s looking for me, I’ll be in the refrigerator. Whisk together the lemon juice, ginger, coriander, cumin, cayenne, and oil in a small bowl. 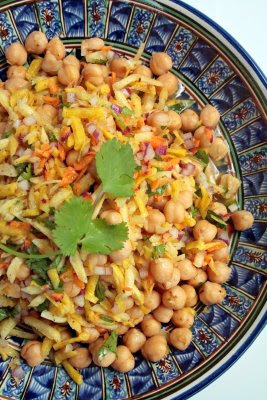 Toss together the carrots, garbanzo beans, onion, cilantro, and dressing in a large bowl and season to taste with salt and pepper. Transfer to a serving bowl and serve immediately. Serves 4. Healthy and light and refreshing for the summertime. 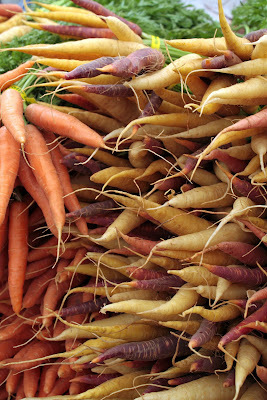 Use sweet, colorful heirloom carrots if you can find them. That temperature would put me in the refrigerator too. Nothing like a beautiful salad to quench the heat! Wow, that looks good. Can't wait to try it with the French carrots I'm growing. Of course that means I'd have to actually get the carrots into the house. Most of them get eaten in the garden after a quick rinse with the hose! 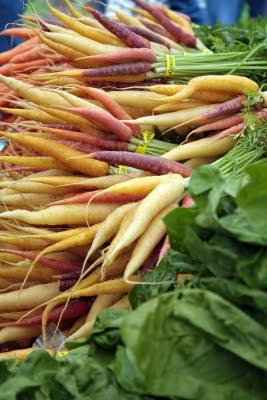 This is definitely on my list to make - sweet carrots, nutty garbanzos, and a spicy dressing - what's not to love? Beautiful pictures and the salad looks so good! My favorite legume is garbanzos! I really like simple cool salads like this. They are really nice on warm summer days when you don;t feel like cooking.